Is it still possible to increase your distance from a spaceship you're piloting? Hold down both mouse buttons and move the mouse in and out to move closer and farther (this replaces the old shift-mousewheel command). If you've ever played Homeworld then this method of moving the camera in and out should be familiar The only downside is that when you release the buttons, if you release the right button last then the context menu might appear, and if you release the left button last then there's a chance you could rotate the camera (so best to release the right button last since the context menu can easily be closed). I don't know if this has been asked before, does everything in space engine like comets, planets, ect. move around in space in space engine? Thanks! I have a question regarding the density of the atmospheres of procedural planets -- how is it calculated? I started thinking about this when I came across a desert planet with 363 atmospheres of pressure, and in the info/wiki box (select the planet and press "I"), the air density was listed at 28g/cm3. That's really dense, even more so than solid gold! Granted it's under enormous pressure, but still, it struck me as odd. After checking out multiple planets this seems to be a common theme, with air densities typically being higher than their solar-system counterparts. I made a small plot of log(pressure) and log(density) for solar system bodies and some procedural planets to visualize. Air density is in red, pressure is in blue, and solar system planets (Earth, Mars, Venus, Titan) are the cluster of four on the left, and the procedural planets are on the right. Solar system bodies consistently have air density 2 to 3 orders of magnitude less than the surface pressure, but this does not appear to hold true for the procedural ones. If the air density is that high, what's the overall density of the whole planet? Let's say that a rocky planet like that could form, what would happen if it had a volcanic eruption - molten lava would bubble up into the air and form rock floes drifting around the planet in the upper atmosphere? by the way; it's a hot desert super-earth with ~6.7 earth masses and ~3 times the surface gravity. Don't expect precise calculation of air density, as long as chemical composition of the atmosphere did not modeled. 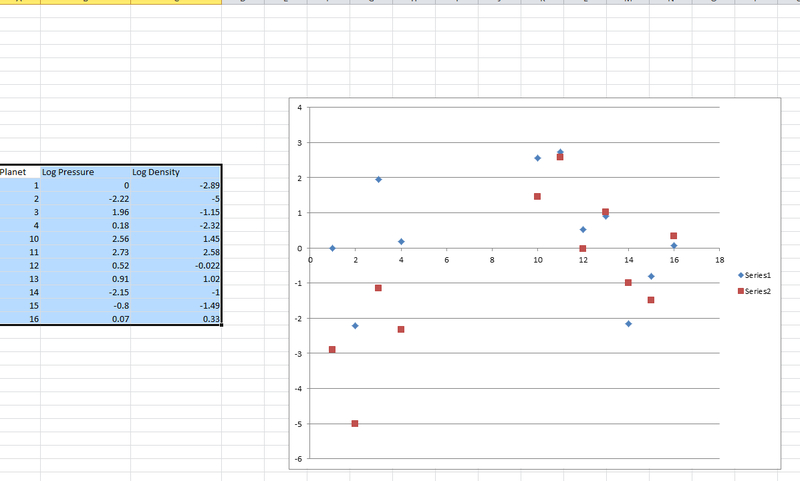 If I remember correctly, density calculated from pressure as simple formula, so it must produce incorrect result. For real planets you may specify any density and any pressure in the script. May still lead to odd values, but should at least eliminate absurd values. In this case the air density would become 8.2 g/cm³. Iron would still float, though. Why does SE's Earth have a molten North Pole? If you mean having water as opposed to ice, then it's because the Earth texture doesn't show sea ice, only land ice. I see. So why does it not show sea ice? So why does it not show sea ice? You'll have to ask NASA. Perhaps James Hansen made it. I'm probably mixing up what Dan Dixon said with what Space Engineer might have said, but didn't Space Engineer say something about putting in the ability to choose the measurement (Kelvin, Celsius, Fahrenheit) that that we want to display? Although given the range of temperatures, using Kelvin is probably more elegant or something.